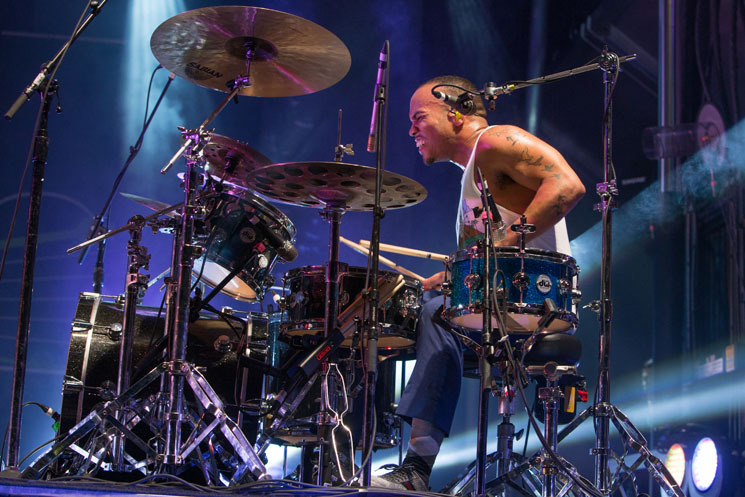 If you had any doubts about the rocketship trajectory Anderson .Paak's career has been on over the past two years, his performance at the Halifax Jazz Festival Saturday night decidedly put them to rest. It wasn't just that .Paak and the Free Nationals delivered a dizzying doozy of a headlining set, infusing .Paak's best material with an adrenaline rush of fevered energy. It wasn't even the smorgasbord of sounds colliding song-by-song, the band treating genres like hip-hop, funk and R&B less like guideposts and more like suggestions. No, it was the crowd that told the story. Much of the audience seemed well-versed in .Paak's work, starting the night amped as .Paak opened with Venice track "Milk n' Honey" followed by a blistering "Come Down" that was absolutely infectious. But, looking around, that infectiousness was also reaching people who might not have been cranking Malibu for the past last year, but had heard that this was the show not to miss. Forget the legacy acts and nostalgia trips that often frequent Halifax's big stages: here was the chance to see an artist not after his best-before date, or even in his prime, but in the middle of his jet-fuelled ascendency. And the crowd, sold out to capacity — not an easy feat in a 5,000-person outdoor venue — was ready to party. Wearing sparkling silver sneakers and a bright blue blazer that didn't last more than a few songs (too much running around to do) .Paak was an engaging, excitable frontman. But he was perhaps even more impressive when he got behind the drum kit. He first did so during "The Season / Carry Me," and from that point in the set it was rare that .Paak wouldn't run to the kit at the side of the stage for at least a portion of the song. Highlights abounded: a soulful "Heart Don't Stand a Chance," a slinky "Suede" (from his NxWorries project with producer Knxwledge) and a massive "Miss Right" that closed out the main set. It may have been another night at the job for .Paak and the Free Nationals (except, perhaps, for DJ Callum Connor, who celebrated his birthday on-stage with a cake that ended up thrown across the stage in jest). But they sure didn't play like it, and the giant smiles and blown kisses from the man whose name was on the bill suggested it might not have felt like it either. As the band returned to the stage to perform Malibu's bookends "The Bird" and "The Dreamer" as a first encore, followed by a joyous sing-along on "Luh You" for a second, it felt like a night few in the crowd — and perhaps not even those on stage — wanted to end.